‘Taste of London’ happens once a year and if you are a chef, front of house, foodie or just enjoy eating then it is an absolute must! Regent’s Park was transformed into a foodie wonderland for four days of summer eating, drinking and entertainment. 40 restaurants set up stalls offering a choice of between two and five dishes to showcase their style of food. There were classic French restaurants like Le Gavroche, Club Gascon and Gauthier Soho as well as Italian restaurants; L’Anima and Babbo and even an entire Thai village. 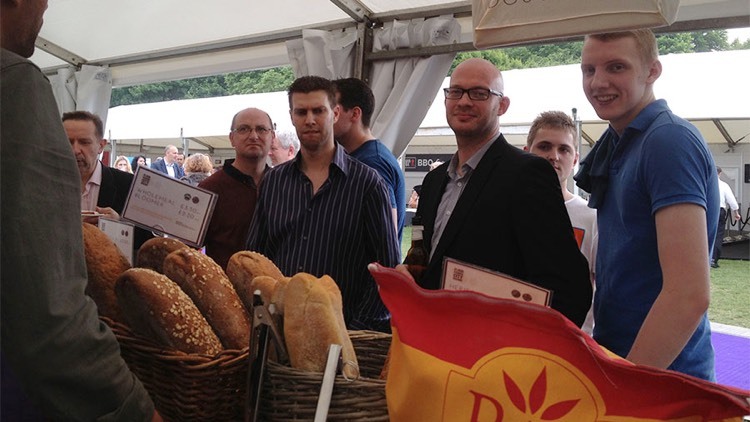 In addition, over 200 artisan producers and premium brands provided a range of the best food and beverages from Britain and around the world. We invited all our senior managers, site managers, head chefs and clients to the event, as we do every year. We set up shop in one of the many bars and this year we chose. This fantastic winery based in Kent produces some of the best British wine and sparkling wine. From our base camp we ventured out into the festival. I had a team of chefs with me and we slowly but surely ploughed our way through all the stalls in search of the best dish. For some of the team, it was their first experience of foie gras, in the form of a burger in a soft brioche bun with truffle mayonnaise. We swiftly moved on to BBQ spiced crispy pigs ears, then on to a multiple pork belly dishes which all fell a bit flat for me. Jasmine smoked beef short ribs ‘pipped to the post’ all the other dishes I tried. Then out of nowhere just when I thought I’d eaten enough, I saw a sign for ‘Spice Market’ which changed everything. Spice Market is a restaurant by Jean-Georges Vongerichten who runs an empire of Michelin starred restaurants in the States and Japan, and this is his first step across the pond to London. Headed up by executive chef Peter Lloyd, the restaurant offers Asian style food with European twists. The dish that immediately grabbed my attention from the menu board was the Pork belly steamed bun with pickled onions. I first became obsessed with steamed buns after watching a YouTube video of a New York chef called David Chang create his version of a steamed bun with slow roasted pork belly, hoi sin sauce, cucumber and spring onions. This was his take on the crispy duck pancake roll which I am sure you are familiar with. Since discovering David Chang’s version it has featured in a lot of my menus I thought that was it, this is as good as it gets! But oh, how naive of me?! A hero of mine and one of the greatest living chefs once said, “In cooking there is very little creation, it is influence, adaptation and evolution” and this was a shiny example of that. David Chang was influenced in his creation by crispy duck pancakes and Peter Lloyd adapted this towards his own tastes and philosophy using a Thai spiced sauce, pickled onions and chilli, finished with fresh coriander. The dish was amazing! So simple but a real flavoursome smack around the chops. It was the only dish I ate twice and I even ran with one clutched in my hand to our MD, Wendy Bartlett so she could share my joy! This was a great day out and I can’t recommend it enough! It is a real treat for all our teams and an event that everyone in bartlett mitchell looks forward to. Our Business Development Director, Lin Dickens even got to meet one of her heroes, Michel Roux. Put the date in your diary for next year and don’t forget if you went to ‘Taste of London‘, let me know what your favourite dish was.